№ surname, nationality, city or place and the date of establishment, the weight of weight, the description of exercise, the result of man/woman. The push of weight it is arbitrary, by alternately left and right hand from the breast. 1. Horoneko Vyacheslav, Belarus,Minsk, 9.5.1998. 16 kg for 24 hrs.18108 reps.
2. Horoneko Vyacheslav, Belarus’ ,Minsk Moscow, 5.9.1998. 16 kg in 1 hour 2598 reps.
3. Horoneko Vyacheslav, Belarus’, Minsk, 3.10.1998. 16 kg in 3 hrs. 5235 reps.
4. Horoneko Vyacheslav, Belarus’, Minsk, 3.10.1998. 16 kg for 6 hrs. 9210 reps.
5. Savelyevs Vladimir, Belarus’, Bobruysk, Minsk, 9/1998. 16 kg for 12 hrs.11180 reps.
1. Avramenko Igor, Belarus’, Minsk, 1998. 16 kg in 1 hour 1150 reps.
2. Avramenko Igor, Belarus, Brest Minsk, 1998. 16 kg in 3 hrs. of 2640 reps. The jerk of weight it is arbitrary, by alternately left and right hand. 1. Dorogiy Tatiana, Ukraine, Vinogradov, Minsk, e.”.200x. 16 kg in 5 minutes 112 reps.
2. Novel Oxana, Ukraine, Vinogradov, Minsk, e.”.200x. 16 kg in 10 minutes 221 reps.
1. Matskevich Sergey, Belarus’, Minsk, Minsk, 3.7.2002. 24 kg in 1 hour of 1225 reps.
2. Matskevich Sergey, Belarus’, Minsk, Serpukhov, 2000. 24 kg in 2 hrs. 2335 reps.
3. Matskevich Sergey, Belarus’, Minsk, Zaporozh’ye 2000. 24 kg in 3 hrs. 3030 reps.
4. Matskevich Sergey, Belarus’, Minsk, Minsk, 2000. 24 kg for 6 hrs. 4922 reps.
1. Ginko Vasiliy, Latvia, Ventspils of g.Minsk, 3.7.2003. 32 kg 5 minutes 142 reps.
2. Matskevich Sergey, Belarus’, Minsk S.Peterburg, 2000. 32 kg for ychas 984 reps.
3. Matskevich Sergey, Belarus’, Minsk Minsk, e.”.2000. 32 kg in 2 hours of 1510 reps. The push of weight is more than 32 kg. 1. 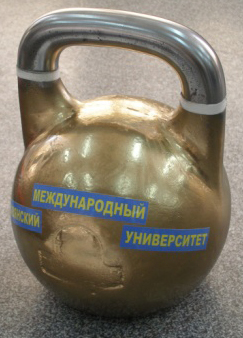 Kuznetsov Yuri, Russia, Lipetsk Lipetsk, 14.6.1998 52+52 kg the push of two weights from the breast 9 reps.
2. Kuznetsov Yuri, Russia, Lipetsk Lipetsk, 14.6.1998 72 kg the push of weight by one hand from breast 6 reps.
3. Changuridi Georgiy, Greece, Athens Minsk, 3.7.2002 48 kg the push of weight alternately in the course of 5 minutes of 86 reps.
1. Horoneko Vyacheslav, Belarus’, Minsk Minsk, 3.7.2003. 32 kg from the breast by one hand sitting in the gymnastic twine in 5 minutes 63 reps.
2. Horoneko Vyacheslav, Belarus’, Minsk Serpukhov, 2000. 32 kg from the breast by one hand sitting in the gymnastic twine in 10 minutes of 100 reps. The lift of the weights of variable mass, it is arbitrary. 1. Filikidi Pantelei, Greece, Athens Lipetsk, 1998. 53 kg the lift of weight in the breast by the little finger of left hand, the push from the breast by one hand (weight on the little finger) 8 reps.
2. Filikidi Pantelei, Greece, Athens Minsk e.1999. 112 kg the lift of weight by the little finger of right hand with the detachment from platform 1 rep.
3. Filikidi Pantelei, Greece, Athens Kiev, 1998. 41,5 kg lift by the little fingers 2- X of the hands of weights (2sht.) with the subsequent press from breast 1 rep.
4. Bakhmatov Victor, Ukraine, Kiev To zaporozh”e, 1998g. 32 kg 5-times lift from the platform 2-X of weights 32 kg by teeth to the complete rectification of body 5 reps.
5. Cut Yuri, Ukraine, Kiev Elbrus (height 4200), 29.7.1995 g. 16 kg juggling by the weight: the revolution before itself 400 reps.
6. Cuts Yuri, Ukraine, Kiev Elbrus (height 4200), 29.7.1995 g. 16 kg juggling by the weight: the revolution through the head of 50 reps.
1. Brazauskas of Edvardas, Lithuania, Kaunas Vilnius, 1998. 16 kg the jerk of weight with the replacement of the hands (arbitrarily) for 5 is hour 8 minutes of 5520 reps.
2. Vorotyntsev Aleksey, Russia, Lipetsk Yelets, 2.2.1998. 16 kg the jerk of weight by the alternately left and right hand (arbitrarily) for 1 hour of 1723 reps.
3. Trusevich Edward, Latvia, Ventspils of g.Minsk, 3.7.2003. 24 kg the jerk of weight by the alternately left and right hand (arbitrarily) in 5 minutes 109 reps.
4. Trifons Sergey, Belarus’, Minsk Minsk, 2000. 24 kg the jerk of weight by the alternately left and right hand (arbitrarily) in 1 hour of 1474 reps.
5. Vorotyntsev Aleksey, Russia, Lipetsk S.Peterburg, 2000. 24 kg the jerk of weight by right hand 400 reps.
6. Polennikov Victor, Russia, Lipetsk, 1998. 72 kg X reps. The fulfillment of exercises regulates. b) with the weight of the weights: 16, 24,32, 40, 48, 56, 64, 72 kg and above (+8 kg) leisure. Noch’yu(000-’00) – is not more than 10 minutes at the end of each hour equipment and inventory. The deviation of the weight of weights from the nominal must not exceed 100 deg. Sizes of the weights: a height – 280 mm, the diameter of housing – 210 mm, the diameter of knob – 35 mm. of weight must be painted with one color, and the arcs of weights leave nekrashenymi, in this case in the base of arc on the side of weight circuits of white color, from one side is placed the weight of weight, and with another – the number of platform (with taking of mass measures, with a large quantity of participants). Putting advertising inscriptions and images is possible. The size of area (platform) – is not less than 2 x 2 m2 (yakh’ m2 – for the power juggling), surface must be not slippery, putting inscriptions and figures is possible. With taking of mass measures (tournaments, festivals, Marathons), where is provided the appearance of several participants simultaneously, the distance between the platforms must be not less than 1,5 meters. Stands and advertising panels must be placed at a distance not less than 2- X it is meter from the platforms. Small table opposite the platform is established for the judges, not less than in 2- X m of it. Near each table on two chairs. 5.2 weights of the nonstandard weight: 40, 48, 56, 64, 72 it is above – they must be maximally approximating standards MFGS. Judical brigade. Judical brigade is completed by the conducting organization and is coordinated with the commission for the registration of records. The necessary condition of registering the record is the presence not less 3rd judges, of them: not less than 2- X (two) of international category and 1 (one) national category. With taking of mass measures (competitions, tournaments, festivals, Marathons), the composition of judical brigade is completed accordingly the position of the rules of weightlifting MFGS. Rights and the responsibility of participants. Participant is obligated to know the rules of the fulfillment of exercises and the requirements, presented by commission for the registration of records, to carry out and strictly to follow im. participant it is obligated to be correct with respect to the judges and the spectators, and so to other participants. Participant has the right to prepare weights for fulfilling the exercise. The preparation of weights is produced in place specially diverted for this purpose, in the visibility range of judical board. Participant has the right to be the representative of enterprise and firm for the advertisement of its production. On this he must inform organizers and obtain to this permission. To participant is forbidden the use of any adaptations, which facilitate the lift of weight (weights). To participant it is forbidden to talk during the fulfillment of exercise. The suit of participant must correspond to requirements presented MFGS. Fulfillment of exercises. 2 min. prior to the beginning of the fulfillment of exercise the participant is called to the platform. A reading of the checking time is taken 10 seconds prior to beginning: 10. 9, 8, 7, 6, 5, 4, 3, 2, 1 s., after which will be given the command ”start”. With the fulfillment of the exercise of that limited by temporary section the judge declares: Checking time – to 10 minutes – each minute; it is more than 10 minutes – not thinner than 1 time 10 minutes. After the fulfillment of exercise last minute declares – 30, 50 seconds, and the latter 10 -posekundno. At the end of checking time will be given the command ”stop”, after which the lifts do not include, and participant is obligated to end the fulfillment of exercise. Each correctly executed lift is accompanied by the calculation of judge on the platform. With the violation of requirements for the technical fulfillment of exercise the judge on the platform will give the command ”not to consider” or makes. With further correct fulfillment of exercise, the calculation continues with the increasing sum. The fulfillment of exercises push and the jerk of weight (weights) – is accomplished according to the rules MFGS, lift in another manner – according to the agreement of structure and conditions for fulfillment with the commission for the registration of records. Order of formulation and supply of claims. The participant or the organization, which plans the establishment of record, are obliged not later, than for 2 (two) month tax into the commission for the registration of records, the claim of the established model (see the appendix), where it is in detail to describe structure and conditions of fulfilling the exercise. After examination by the members of the commission of claim, is produced the correction (if in this appears need) and it is asserted permission to the fulfillment of exercise. The presence of the quorum of the judges of that stipulated in p. 6 of given rules is the necessary condition of registering the record. With taking of mass measures (festivals, tournaments, Marathons): The supply of preliminary nominal claims into the commission is optional the composition of judical brigade it must correspond to the requirements of rules MFGS. Record is considered established with the clear fulfillment by a participant in the rules and requirements, affirmed TO MFGS and commission for the registration of records. On the fact of the establishment of record, by organizers the correctly designed protocol of the established model (see the appendix), and so (on possibility) photo, video materials and newspaper publications. With taking of mass measures the organizers present into the commission additionally the summary protocol of the competitions (see the appendix). The financial expenditures, connected with conducting and organizing of competitions, tournaments, Marathons, festivals, and so with the business trip of participants, judges, representatives of commission for the registration of records – bear the conducting structures. Starting payments. During the supplying to the necessary documentation for registering the highest world reaching, the participant is obligated to pay payment in the sum of equivalent 20 (twenty) US dollars, on the course of national bank. Athlete, who participates in the tournament, Marathon, festival, pays payment on the place of taking measure. The obtained money used by the commission: To the yearly publication and the circulation of billyutenya of the highest world achievements in the nontraditional forms of weightlifting. To conducting and organizing of competitions, tournaments, Marathons, festivals and the formation of their prize fund. Preliminary claims are represented: ul. Mogilev d.’8, Minsk, 220007, republic Belarus’ the bodies: (+375017) 224 28 05; fax 222 73 14; e-mail: http://www.belat.by The chairman of commission – Kalinin Aleksandr fedotovich ul. Plekhanov d. 3, kV. 205, Lipetsk, 398050, Russia the bodies: (+7 0742) 77 87 16, 74 06 89; e-mail: http:// www. lipetsk.ru/ the President OF MFGS – stories Vladimir semenovich application is is 1 CLAIM FOR the establishment of the highest world reaching in the nontraditional forms of weightlifting. Intermediate time is result the final result of of lifts forof . (minute, hours) the judical brigade: 1.X,2.X, 3.X. Position about conducting of the festival of power it is specific the sport of that dedicated to Independence Day of republic Belarus’ purposes and task development and popularization of power it is specific sport in the republic Belarus’. Propagandas of the healthy means of life. Strengthenings and the development of the friendly connections between the countries. Increases in the sport craftsmanship of athletes. Developments of the strongest athletes.Periods and place of conducting festival is conducted in Minsk – from 2 through 4 July, 2004, in the period of the celebration of Independence Day of republic Belarus’, on the open area of city. Day of the arrival on 2 July, 2004. Management of conducting the general management of preparation and of conducting competitions is achieved BY JOINT STOCK COMPANY Of ”belattraktsion” and by commission for the registration of records with MFGS. Direct conducting is laid on the main judical board, affirmed by the organization committee of festival. Participants in the competitions to the participation are allowed the strongest athletes of the countries OF THE CIS and distant zarubezh’ya, which have the admittance of doctor, which presented into the organization committee preliminary claim and paid starting payment. Procedure the program of competitions is developed on the basis of the previously represented claim fors participation. Rewarding the conquerors of competitions and prize-winners, and so participants, who established the highest world achievements are rewarded by diplomas, medals. Financing and conditions of the reception of participants IN JOINT STOCK COMPANY Of ”belattraktsion” bears expenditures on organization and conducting of festival, payment of the work of judical brigade and service personnel, rewarding of participants. Is possible, additionally the attraction of sponsors. All expenditures on the business trip of participants and representatives (stay, daily, passage, nourishment, starting payment) bear the sending on mission organizations. Starting payment from each participant is equivalent 15 (fifteen) to US dollars (in the Belorussian rubles on the course of the national bank of republic Belarus’). The personally invited athletes from the payment of starting payment are freed. – the house of bodies. (+375-17) 237 31 95 Matskevich Sergey Alexandrovich (member of organization committee) (+ 375296) 82 71 62 nominal claims in the established form are represented into the main judical board not later than on 15 June, 2004. Athletes, who did not represent information from the doctor, to the competitions are not allowed. Note: The questions, not stipulated in this position, are solved on the judical board of festival. This position is official call to the competitions. The commands of the countries OF THE CIS and distant zarubezh’ya must have with themselves two national flags of the country and records of the national anthem. The festival of power is specific sport dedicated to Independence Day of republic Belarus’ (protocol of competitions) 1 – on 3 July, 2003, the program of festival included competitions in the power juggling (tape-measure) and establishment of the highest world achievements in the nontraditional raising of weights. 2. Izofatova Veronica, Belarus’ 1 21 2 Ryabets M.A. 2. Horoneko Vyacheslav, Minsk, Belarus’ e2kg press, sitting in the gymnastic twine in the course of 5 minutes of 63 Ryabets M.A. 3. Ginko Vasiliy ventspils, Latvia 32 kg push alternately in the course 5 minutes (arbitrarily). 142 reps.
3. Trusevich the Edward of Ventspils, Latvia 2yakg jerk alternately in the course 5 minutes. 109 reps.